In Adé, a free-spirited American woman and a Swahili Muslim man fall in love on the exquisite island of Lamu, off the coast of Kenya. There, they create their own paradise: living in a traditional small white house and creating their private language of intimacy. After an intense courtship, Adé asks for Farida’s hand in marriage. But when Adé and Farida are forced to leave the island in preparation for their wedding, Farida is faced by the unsettling and often violent realities of life on the mainland. And just as the Persian Gulf War begins, Farida succumbs to a disease that almost kills her, and alters her relationship with Adé forever. A transcendent love story turned tale of survival, Adé explores what happens when one couple’s private idyll is interrupted by a world in the throes of massive upheaval. Buy a copy at Amazon. Magical. Lyrical. Haunting. Those are the three words that came to mind from the first page of my copy of Rebecca Walker’s amazing novel Ade’, a Love Story, and by the time I was just a few more pages into the story, I was already swept into the tide of Farida’s life – from college student to world traveler to lover, to, finally, just WOMAN, she seemed as real to me as many of my own friends. I could see her in my minds eye, asking local people in various desert countries to help her broaden her vocabulary, until their words felt like her own, and I could feel her thirst for connection and passion. Her friend Miriam also reminded me of people I knew – still know – and while I can’t say that I disliked her, there were times when she annoyed me a little. “Stop trying so hard,” I’d tell the version of her in my imagination. But then I’d remember my own feelings of being an outsider. Ade’, the title character himself, was also very real to me, but I saw him in soft-focus, through Farida’s eyes. Maybe it helps that my mother dated an Iranian man when I was a toddler (my father was never in the picture) or that I grew up in a diverse group of people from many different cultures, but I could almost hear his accent, his speech patterns – almost smell this skin. It’s no secret that I read in the bath a lot. Even though my copy of Ade’ was a digital copy, and an uncorrected proof version at that, courtesy of TLC Book Tours and NetGalley, I took my Kindle into the bath with me to read this novel, and didn’t come out til the water was ice cold and my fingers and toes totally pruney. Why? Because this book is THAT entrancing. The language, the settings, the characters – all so vivid and so real. Rebecca Walker, I know from her bio, writes for Marie Claire so it’s possible that I’ve read some of her stuff without knowing it, as I’m a long-time subscriber to that magazine. At times her voice seemed incredibly familiar, and that only made me enjoy the book more. 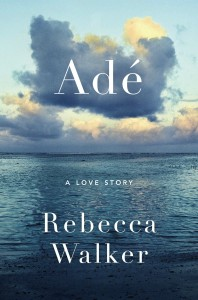 Ade’ is a love story, and I am in love with Ade’ and with Ms. Walker’s writing. Brava! Goes well with: falafel, sweet potato fries, and yellow lentil soup. 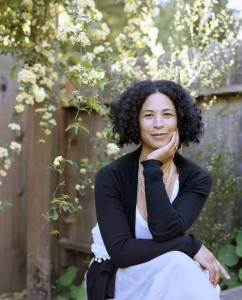 Rebecca Walker is the author of the best-selling memoirs Black, White and Jewish and Baby Love, and editor of the anthology Black Cool. She is also the editor of the anthologies To Be Real, What Makes a Man, and One Big Happy Family. Her writing has appeared in Bookforum, Newsweek, Glamour, Marie Claire, The Washington Post, Vibe, and Interview, among many other publications, and she blogs regularly for The Root. The lovely people at TLC Book Tours have given me the opportunity to make a gift of this book. Leave a comment telling me about YOUR one true love, and you could get a copy of your own.